Infusions and decoctions allow you to release the healing properties of herbs into water. The value of many medicinal herbs lies chiefly in their volatile oils. The process to extract the medicinal virtues need not be complicated. Just make sure you are familiar with the many different preparations. 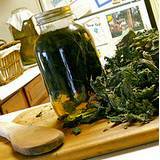 You may also want to try Macerations, depending on what type of herb you are using. 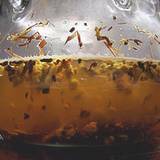 The two ways to extract medicinal properties from herbs to make teas are fusing and decocting. Which process you'll want to try will be determined by the part of the plant used to make the tea. When working with the delicate parts of an herb the leaves and flowers you'll want to make an infusion. 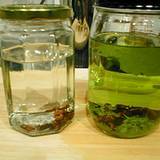 Making an infusion involves pouring hot water over the herbs and then steeping the herbs in water. If you are using the tough parts of the plant like the roots, bark, twigs, seeds or berries you'll want to make a decoction. 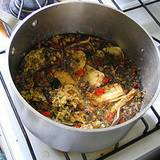 To make a decoction, simmer the tough parts of the herbs in boiling water. The process can also be used to reduce or boil down herbs to make a stronger preparation, for example, the base of cough syrup. 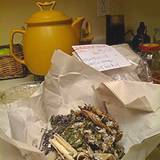 If a remedy combines leaves or flowers with bark or roots, make a mixed decoction/infusion for best results. When preparing a decoction or infusion from plants from the wild, make sure they are correctly identified. If there is any doubt, do not us the herb. Infusions and decoctions allow you to release the healing properties of herbs into water. The value of many medicinal herbs lies chiefly in their volatile oils; in order to keep these valuable oils from being evaporated while heating, keep the heat low and cover the pot when preparing. 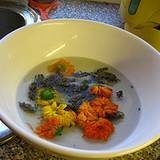 Macerations Boiling diminishes the active ingredients of some herbs, such as valerian root or dill. 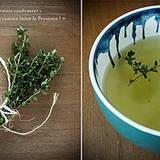 It is possible to process delicate herbs without heat by making a cold maceration: Place 2 teaspoons of dried herbs in a glass dish. Pour 2 cups of cold water over the herbs and let stand overnight. Strain. Add honey to taste. You can enjoy the drink 3 times daily. An average dose is about a teacup full, three times a day of an infusion or decoction. Use smaller doses for children or the elderly. Some herbs, such as feverfew, are so strong tasting that they are not always suitable for infusions or decoctions. Caution:Always verify the safety and heck toxicity warnings of the herbs you are planning to use, or check with an herbalist. Utensils You can refrigerate infusions and decoctions for about 48 hours. always use glass or enamel containers or stainless steel and wooden spoons or steel knives. Sieves should be plastic or nylon. Caution: Never use aluminum as this element can be toxic and easily absorbed by the herbs. The process to extract the medicinal virtues of an herb need not be complicated. Just make sure you are familiar with the many different preparations. Pot Infusions For pot infusion, add the herbs toa teapot and pour in boiling water. cover and let it set for 10 minutes. Stain. Try a solar infusion for very delicate herbs, such as chamomile or mint, to keep in essential oils. Place herbs ina glass container and add water that is room temperature; cover. Let it stand in direct sunlight for several hours. Add 2 teaspoons of the heb to 1 cup of cold water. Let the mixture stand for 8 - 12 hours; strain. Take it as you would an infusion. Soak a cloth in an infusion or decoction that has been cooled. Wring out the cloth and apply it directly to injuries, swollen joints and inflammations. 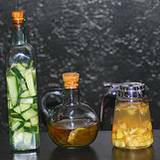 Soak a cloth or towel in an infusion or decoction. Wring it out and apply hot if you need to bring heat to an area. Warm the pot, then add 1 teaspoon of herbs per cup. Pure boiling water into the pot, cover and let steep for 10 minutes, strain. Sweeten to taste. Break herb material into small pieces and put 1 teaspoon of herbs per cup into a saucepan. Cover water and bring to a boil. Simmer gently for about 10- 20 minutes or until the water is slightly reduced. strain through a sieve. Mix the bark, berries or roots in a saucepan and add water. Bring to a boil and gently simmer 10 - 20 minutes. Place the flowers and leaves in a teapot. Strain the hot decoction into the teapot and infuse for 15 minutes. Strain the mixture into a glass container.